You can now add your signature to PDF documents from within Dropbox. No more downloading, printing, scanning, etc. You don't need to leave the chat program to share Dropbox files with a colleague. 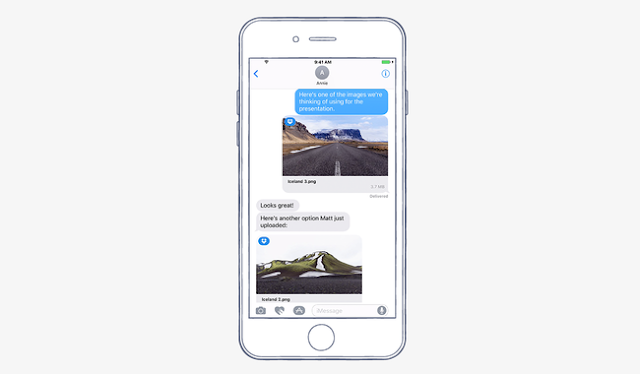 Simply drop them directly into iMessage. From within iOS 10, you can add a Dropbox widget to your lock screen. The wisdom of this move I leave up to you. But it will allow you to create, view, upload files and scan receipts into your Dropbox account without unlocking anything. Dropbox will now notify you as soon as someone saves a new version of the file you're working in. Tap and the file will reload. In the coming weeks, Dropbox says it will be adding split-screen support that will let you work within Dropbox and other apps on your iPad simultaneously. For now, the new apps supports picture-in-picture, which lets you watch a Dropbox-stored video while working in another program.